Your garage door is broken? Out of track? Does the door refuse to close? Is the door making strong noises? Has it been a while since your garage door was maintained and tuned? If the answer to one of those questions is YES, it is probably time you will contact J&C Garage Doors, to come and inspect the door. We have successfully repaired and installed hundreds if garage doors in Westchester County NY, and of course in Mamaroneck. 1. Check if the battery of the remote is not empty. If it is empty, replace it. 2. Make sure that there is electricity in your garage, If not, contact a licensed electrician to come and fix it. If you checked those 2 things, but still there is something wrong with the opener, we will be happy to help. we offer same day repair and installation for garage door opener in Mamaroneck NY, so you can be sure that we can get your garage door working again today. Many times in life, we try to save few dollars, and we find ourselves spending more than we planned to save. Same thing with the garage door opener – do not try to save few dollars by purchasing a cheap opener that probably last for 2-3 years before it is going to need to be replace or repaired, when you invest in high quality opener, you should have an opener that is going to serve you 5-15 years, and we witnessed openers that were installed before that and that still do the job. 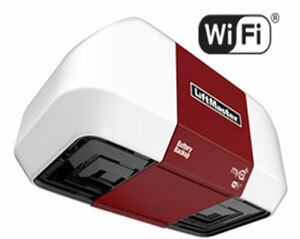 If you are looking for a garage door opener installation in Mamaroneck, please contact us, and we will be on our way. You can try and extend the life time of the garage door springs, but no matter what we do, every spring will eventually break. No matter if it is torsion spring system or extension spring system, one day you will have to replace it. Since the garage door springs are under a lot of tension, when a spring break, it usually followed with a loud noise. Although it is scary, there is almost nothing you can do, besides stop using the garage door and contact a garage door company that repair broken springs. If you have extension springs, you should make sure that your garage door is equipped with safety cables. The safety cables are there for the day that the spring will break. In order to avoid damage to the door or to objects which located next to it, the safety cables will try to restrain the broken spring from breaking something.if you are located in Mamaroneck, and you need someone to install safety cables for your door, or if you are not sure if such cables were ever installed, you can contact us and we will try to help. Please note: not every spring match every garage door, using the wrong spring, or using a spring that wasn’t correctly adjust can be dangerous. A professional garage door repairman knows how to match the right spring for the right door, and know how to put tension on the spring, to fit the needs of the garage door. J&C Garage Doors offer top quality garage door installation in Mamaroneck NY, including wooden garage door installation, opener installation and much more. There are many garage door problems, which can prevent garage door from working properly. It can be a spring that snapped, a cable that snapped, or a panel that snapped. But one of the most dangerous problems, that we deal with almost every day while servicing overhead doors in Mamaroneck 10543 is out of tracks garage door. Whether it is a garage door repairs in Mamaroneck, commercial garage door in the Westchester County, or out of track overhead door in Greenwich, if you will look at your garage door, you will find that what holding the overhead door in Mamaroneck on the tracks, are the door’s rollers. When the roller jump out of the track, the door cannot, and shouldn’t be operated, until a garage door expert will put it back on the tracks. You may consider pushing the roller or the rollers back into the tracks, and not using a qualified garage door technician in Mamaroneck to do the repair, but that will be a mistake, since when garage door in Mamaroneck is out of tracks, there is a reason for that, and the reason should be taken care of before the door can be used again. If you will not address the issue, the door can come out of tracks again, and the next time can be even more dangerous, since the overhead door can fall completely out of the tracks. There are many reasons that can make a garage door in Mamaroneck jump outside of its tracks. But no matter what is the reason that made the door go out of the tracks, the important thing is to stop using the door and wait for a qualified overhead garage door technician in Mamaroneck to fix it. The reasons can change from one door to another, and from commercial garage door repair in New Rochelle, to residential garage door repair in Dobbs Ferry. What matter is that you will use a professional garage door repairman in Mamaroneck for the repair, and that you will not try and force the door to open or close. Sometime the door may be completely stuck and sometime it can still be moved, but that doesn’t mean that you should try and move it. Someone hit the door with the car: The garages in Mamaroneck are relatively small, and not once we receive calls from people who tried to exit the garage, and accidentally hit the door with the car. In that case the repair can be simple or complicated, it all depend on the amount of damage to the door. We know that it may seem simple to push the roller back into the tracks, thinking that the door will work again. But what you do not know is that doing so can be dangerous, and the best thing will be to call a garage door repairman in Mamaroneck New York to fix the door for you, make sure that it is safe for use again, and only then get back to use the door. There is a problem with the door mechanism: The garage doors in Westchester New York operate with spring system. It can be a garage door in Richmond County New York, or a garage door in Nyack New York. No matter what door you own, or where you are located, do not use a broken garage door. If your door suddenly jumped out of tracks, it may be to several reasons, like broken spring, snapped cable, or broken roller. The important thing is to let everyone know that the door is broken, and call Overhead Door Company in Mamaroneck to fix the out of tracks garage door for you. Broken roller: As we explained, the rollers are what connect the door to the tracks. And if you live in Mamaroneck, and you have been ignoring the need for garage door maintenance and lubrication like every garage door in New York need, you probably going to need garage door repairs service in Mamaroneck. But even if you did maintained and lubricated your garage door in Mamaroneck on time. Some of the garage door parts, like the rollers and pulleys need to be replaced once in a while, no matter how much you lubricated them. And using the door although the rollers or rollers are broken will make the door jump out of tracks again and again. 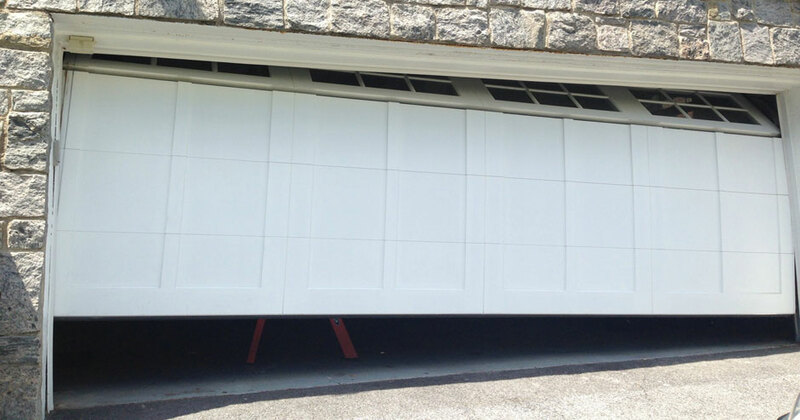 J&C Garage Doors can repair any broken garage door in Mamaroneck. Whether you need garage door repair in Mamaroneck, or garage door repair in White Plains, we can fix your garage door today. There are many overhead doors in Mamaroneck New York. From single car garage door, to commercial overhead door, Mamaroneck Garage Doors can fix all of them. But when it comes to commercial garage door in Mamaroneck New York, the service become more serious, and it required (Besides deep knowledge in the garage door service field in Mamaroneck) special tools and parts that allow us to deal with any type of overhead garage door in Mamaroneck New York, commercial and industrial. When an overhead garage door get stuck, and it doesn’t matter if it is a commercial garage door in Mamaroneck, or a residential overhead garage gate, the first you should do is to stop using it, and to contact a local garage door company who offer same day garage door services in your area. Many times when we arrive to service a commercial garage door near Mamaroneck, we discover that beside the problem which prevented the garage door from working in the first place, there are more problems which accrued due to repeat trying to operate the door although it is broken. In most cases, if you will try to force the garage door opener to open or close the door, instead of using a garage door service in New Rochelle, you will burn the opener, something that eventually will lead to a bigger damage and as result to a repair that will take longer, and that will cost you more. And as the owner of a business in Mamaroneck New York, you probably know the value of a garage door which operate perfectly, and that doesn’t require garage door technician in Mamaroneck to come and fix it every other month. Broken commercial garage door spring is a common problem that we need to deal with on a daily base while servicing commercial garage doors in Mamaroneck 10543 NY. 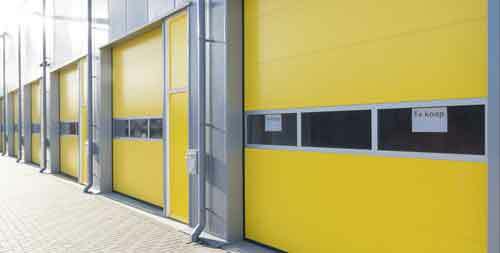 Most commercial garage doors in Mamaroneck are equipped with torsion spring system, which is the preferred spring system for commercial overhead doors in Mamaroneck. When one (or both) of the springs snapped, or if the spring is not adjust correctly, there is nothing much you can do except contacting a garage door company in Mamaroneck who specialize in commercial garage doors repairs. 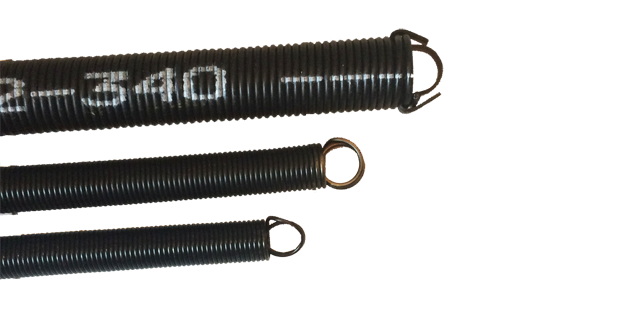 The commercial garage doors in Mamaroneck often require custom made torsion springs, to fit a heavy duty garage door. Do not think to locate a home depot branch in Westchester and purchase springs for your garage door from them. Those kind of springs cannot be found in Home Depot, or other hardware stores in Mamaroneck since it require a garage door expert in Mamaroneck who can deal with heavy duty overhead door with a broken spring. We carry with us springs for many overhead doors in Mamaroneck New York, and we may also carry with us the required spring to repair your garage door. But in some cases, especially when it is a case of a commercial heavy duty garage door in Mamaroneck, we may need to measure and weigh the overhead door, and to come back with the needed spring. But there is no need to worry. As we did with all overhead garage doors in Mamaroneck that we repaired, we will give you a temporary solution, until we return with the spring for the replacement. Most likely, within a day if you are located in Mamaroneck and you are local to us. Every commercial garage door in Mamaroneck need its own size of springs. And the exact size of spring. There is no “maybe” or “almost” when it comes to commercial garage door springs. If you will install the wrong spring, or if you will use the right spring but won’t install it correctly, it can be dangerous. So let us do what we do best, which is to replace commercial torsion springs in Mamaroneck New York. If your commercial overhead door in Mamaroneck went out of its tracks, call us now for a same day service in Mamaroneck. It may seem attempting just to push and force the roller back into the tracks, and it may temporary solve the problem, but you shouldn’t do that. There is a reason why the garage door went out of its tracks. And pushing the roller back into the track will not solve the problem, and can put people who use the door at risk. Remember that the rollers inside the tracks are what holding the door, and when the rollers coming out of the tracks, the door can fall down, and you can imagine how dangerous a commercial garage door can be that weigh hundreds or even thousands of pounds may be. With our same day commercial garage door services in Westchester County and in Mamaroneck NY, we can fix your garage door today. If it is time to replace your old garage door, and install a new overhead garage door, this article can help you make the right decisions on your way to a new overhead garage door. We are located in Westchester County New York, but this article can be used for anyone who plan to purchase and install a new garage door. You may be looking for a new garage door in New York, a new garage door in Westchester County, or even for overhead doors service in La Puente. This article will help you make the right decision on your way to a new overhead garage door. Repair broken doors in Mamaroneck isn’t always the wisest decision! Yes, sometime fixing the broken garage door may cost you more than completely replacing the door. In most cases, when it comes to garage door repair, the condition of the existing garage door is what help us determine if replacing the existing door is the best choice. We wish that all the overhead garage door need to work again is some adjustments, and replacing few parts, then for sure you should keep the existing door, and not even considering to replace it. But if the door is rotten, have many broken parts (especially when it comes to broken panels, tracks or frame), then maybe it is better for you to consider to replace the whole garage door. A new garage door in Mamaroneck 10543 NY will probably cost you less than it would cost you to repair the door, but if you look at it as an investment for many years, you may find that fixing the garage is the right choice for you. Not only that you will get a new garage door, but you also may save money that you would spend on a garage door that may break again soon. So if your garage door is broken, and needs thorough repairs, think twice if repairing it will be the best thing to do. The door is too old: As we explained in the case above, not every garage door can be repaired. 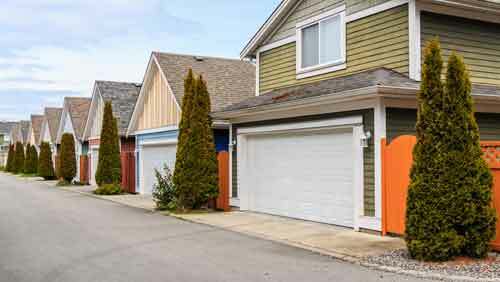 If the door is rotten, falling apart, or any reason that prevent the door from working safely, replacing the garage door may be the right decision. Broken parts: If you find that you need to contact garage door repair service in Mamaroneck or every other year, there may be a deeper problem that need to solve. Sometime it can be solved, and sometime the whole door need to be replaced. This happen mostly when the wrong door was installed, or if the installation wasn’t performed by a qualified installer. Cosmetic reasons: Many garage doors are installed at the front of the house, and when they get old, and weren’t maintained on time, they affect the way your home looks from the outside. New garage door can make your home looks nicer, and change the appearance of the place where they are installed. The door is not the right door for you. If you are currently using a steel hollow garage door, instead of a high quality insulated garage door, you may want to consider replacing the door. There are many qualities that can be earned when installing an insulated overhead door, especially if you live in New York and would like to reduce the affect that the cold may have on homes in New York. Safety reasons. The new doors are stronger, and improved than the old doors. Many of the old doors can be opened from the outside by a burglar. As you can see in this Video, your garage in Mamaroneck 10543 is not as secured as you thought!